"Francesco Patrizi" redirects here. For the bishop of Gaeta, see Francesco Patrizi of Siena. Statue of Franciscus Patricius in Cres. Franciscus Patricius (Italian: Francesco Patrizi, Croatian: Franjo Petriš or Frane Petrić; 25 April 1529 – 6 February 1597) was a philosopher and scientist from the Republic of Venice of Croatian descent. He was known as a defender of Platonism and an opponent of Aristotelianism. In Croatia he is mostly referred to as Franjo Petriš or Frane Petrić (sometimes Petris, Petrišević and Petričević). His family name in Cres was known as Petris. Franciscus Patricius was born in Cres (Italian: Cherso), today in Croatia, then the territory of the Republic of Venice. According to the family legend, the Petriš family (Patricius was his Latin name) was of noble (patrician) origin from Kingdom of Bosnia and was forced to flee from the crumbling Bosnian kingdom after the Ottoman invasion. As a young man, he traveled the Mediterranean with his uncle Georgius (Juraj) Patricius, who commanded a galley in the wars against the Ottoman Empire. He gained the patronage of the Greek Orthodox Bishop of Cyprus, who brought him to Venice, where his abilities were immediately recognized. He studied economy in Venice, then he moved to study in Ingolstadt under the patronage of his cousin Matthias Flacius (Matija Vlačić). Then he went to study medicine and philosophy at the University of Padova. Here he was elected twice as a representative of the students from Dalmatia. After graduation he lived in different cities in Italy: Ancona, Rome, Bologna, Ferrara, Venice. He later moved to Cyprus where he spent seven years. Here he attended upon the Bishop of Cyprus who send him back to Italy, where he traveled to Venice, Padova, Genoa, and even to Barcelona. He finally went to live in Ferrara, a center of Platonism in Italy, where he was appointed to the chair of philosophy at the University of Ferrara by Duke Alfonso II. He was subsequently invited in Rome by Pope Clement VIII in 1592, where he spent five years as the chair of Platonic philosophy. Here he became a member of the Council of St. Jerome, at the Illyrian College of St. Jerome. Patricius died in Rome, and he was buried in the church of Sant'Onofrio, in the tomb of his colleague Torquato Tasso. 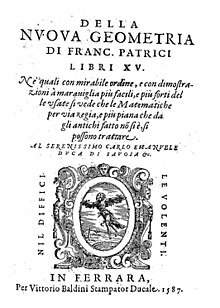 In spite of his continual controversies with the Aristotelians, Patricius managed to make a comprehensive study of contemporary science, publishing in 15 books a treatise on the New Geometry (1587), as well as works on history, rhetoric and the art of war. He studied ancient theories of music, and is said to have invented the thirteen-syllable verse form known subsequently as versi martelliani. In his philosophy he was mainly concerned to defend Plato against the followers of Aristotle. His two great works, Discussionum peripateticorum libri XV (Basel, 1571), and Nova de universis philosophia (New Philosophy of Universes, Basel, 1591), developed the view that, whereas Aristotle's teaching was in direct opposition to Christianity, Plato, on the contrary, foreshadowed the Christian revelation and prepared the way for its acceptance. In the earlier treatise he attacks the life and character of Aristotle, impugns the authenticity of almost all his works, and attempts to refute his doctrines from a theological standpoint. In the second and greater work he goes back to the theories and methods of the Ionians and the Presocratics in general. Patricius' theory of the universe is that, from God there emanated Light which extends throughout space and is the explanation of all development. This Light is not corporeal and yet is the fundamental reality of things. From Light came Heat and Fluidity; these three together with Space make up the elements out of which all things are constructed. This cosmic theory is a curious combination of materialistic and abstract ideas; the influence of his master Bernardino Telesio, generally predominant, is not strong enough to overcome his inherent disbelief in the adequacy of purely scientific explanation. His practical work included a scheme for diverting a river to protect Ferrara and military strategy. De rerum natura libri ii. priores. Aliter de spacio physico;aliter de spacio mathematico. Ferrara: Victorius Baldinus 1587. De spacio physico et mathematico. Ed. Helene Vedrine. Paris: Libr. philosophique J. Vrin, 1996. Nova de Universis philosophia. (Ad calcem adiecta sunt Zoroastri oracula cccxx. ex Platonicis collecta, etc. Ferrara. 1591, Venice 1593. L'amorosa filosofia. Firenze, F.Le Monnier, 1963. Della poetica. ed. critica a cura di D. A. Barbagli. Bologna, Istituto Nazionale di Studi sul Rinascimento, vol. 1-3 1969-1971. Della poetica...la deca disputata. Ferrara. 1586. Della retorica dieci dialoghi... nelli quali si favella dell'arte oratoria con ragioni repugnanti all'opinione, che intorno a quella hebbero gli antichi scrittori (Deset dijaloga o retorici). Venetia: Appresso Francesco Senese, 1562. La Città felice, Venice: Griffio, 1553. In Utopisti e Riformatori sociali del cinquecento. Bologna. N. Zanichelli. 1941. L'Eridano. In nuovo verso heroico...Con i sostentamenti del detto verso. Ferrara. Appresso Francesco de Rossi da Valenza 1557. Parere del s. Francesco Patrici, in difesa di Lodovico Ariosto. All'Illustr. Sig. Giovanni Bardi di Vernio, Ferrara 1583. Book cover of the Patricius/Petriš biography written by Academician Žarko Dadić, member of the Croatian Academy of Sciences and Arts, published in Zagreb in 2000. Le rime di messer Luca Contile...con discussioni e argomenti di M. Francesco Patritio. Venezia. F. Sansovino 1560. Al molto magico et magnanimo m. Giacomo Ragazzoni. In Giacomo Ragazzoni. Della Mercatura. Venice. 1573. In Chronica Magni Arueoli Cassiodori senatoris atque Patricii prefatio. Sta in Speisshaimer, Iohan. Ioannis Cuspiani...de Consulibus. Basel 1553. La militia Romana di Polibio, di Tito Livio, e di Dionigi Alicarnaseo. Ferrara. 1583. Zoroaster et eius CCCXX oracula Chaldaica, eius opera e tenebris eruta et Latine reddita. Ferrara. Ex Typographia Benedicti Mammarelli. 1591. Brickman, B. An Introduction to Francesco Patrizi's Nova de Universis Philosophia. New York, 1941. Robb, N. Neoplatonism of the Italian Renaissance. London, 1935. Chisholm, Hugh, ed. (1911). "Patrizzi, Francesco" . Encyclopædia Britannica (11th ed.). Cambridge University Press. This page was last edited on 17 October 2018, at 10:24 (UTC).